This is great news for people with atrial fibrillation (AF) who take the newer anticoagulants Eliquis or Xarelto. According to a recent article in Cardiology News the FDA, in early May 2018, approved Andexxa (Portola Pharmaceuticals), the first reversal agent for the popular newer anticoagulants Eliquis and Xarelto. 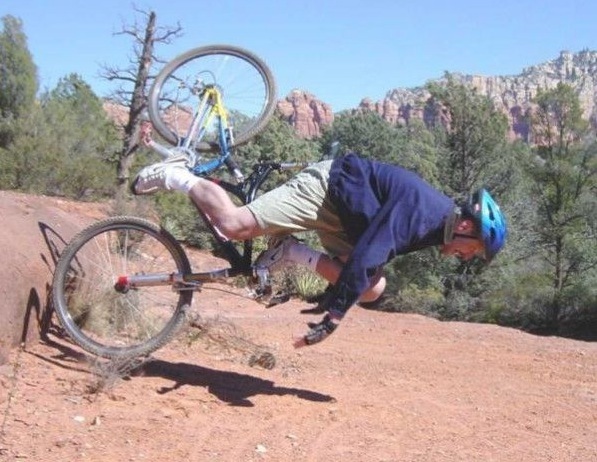 I think runners and mountain bikers, correctly, worry about problems with excessive bleeding while on anticoagulants because we are certainly at increased risk of falls or of being hit by a car, and many have hesitated to transition from warfarin (Coumadin) because of the lack of a reliable reversal agent. Pradaxa (dabigatran) and warfarin both already have reversal available reversal agents. 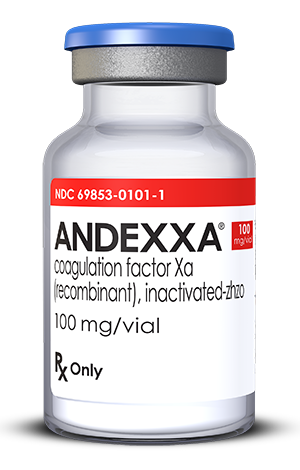 Andexxa acts as a decoy molecule and essentially binds to the drug preventing it from interacting with clotting factors. 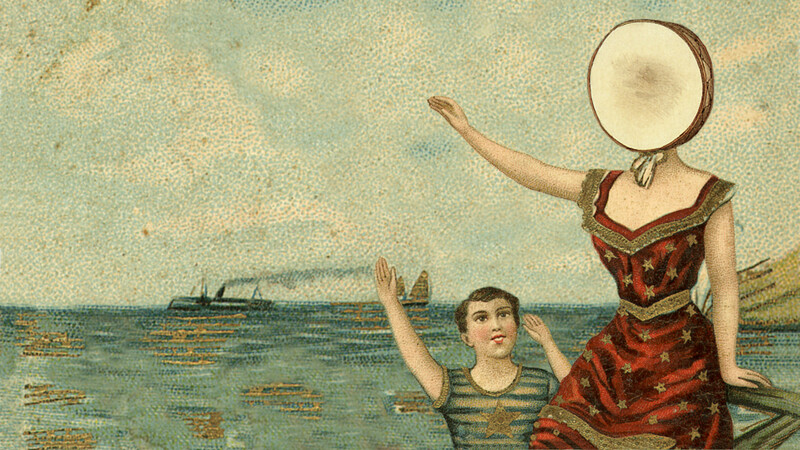 But wait – there’s catch! Andexxa has been approved but as the writing of this blog post (May 23, 2018) it is not yet available. It exists, but you can’t get it! I called one of the pharmacists at our hospital (Sky Lakes Medical Center) and asked if it was going to be readily available at our hospital – that’s when I discovered that it wasn’t yet being distributed – but she told me that our hospital plans to have it in stock and available for use. She also said that once Andexxa is actually available our hospital would then develop guidelines for usage of the new drug. These have not yet been declared but she expects that it will be similar for guidelines pertaining to the reversal agents for Pradaxa and warfarin which are 1.) Patients with serious, life threatening bleeding and 2.) Patients who need emergency surgery. I think that means that people having elective surgery (like a knee replacement) will not be eligible and will have to taper off their anticoagulant and bridge with Lovenox, just like they do now. I imagine that emergency surgery refers to surgery that is necessary to save your life, not necessarily surgeries like fracture repair, where it would be possible to wait a few days. As far as my personal experience – I take warfarin and don’t intend to change. I had taken Pradaxa for several years and was very happy with it until I had a mini-stroke and a trans-esophageal echocardiogram revealed that I had a blood clot in my left atrium. The next big question, of course, is how much will Andexxa cost? 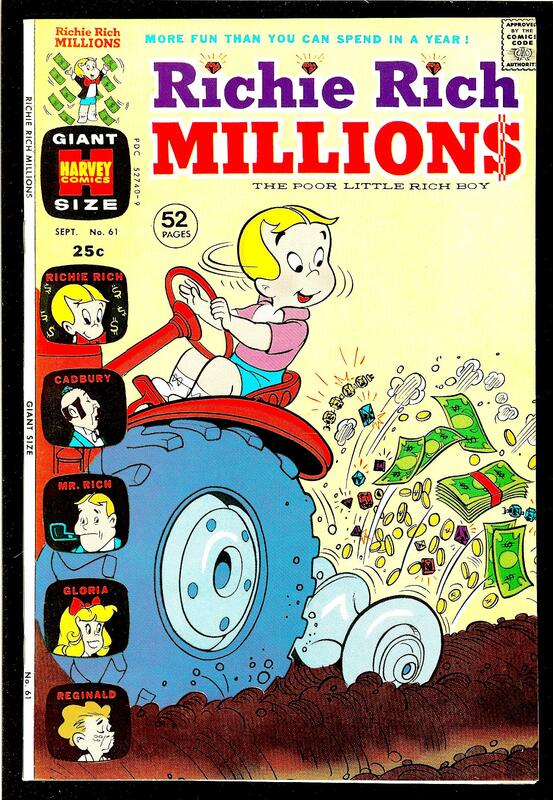 I have no idea and I can’t find any information about cost – but I’m guessing it will be really expensive. But then again – people who are anti coagulated and have life threatening bleeding or need emergency life-saving surgery can just go ahead and get Andexxa and worry about how to pay for it later. Any comments are appreciated! Thanks for reading. This article is a work in progress and is only a description of my strategy for the time being. 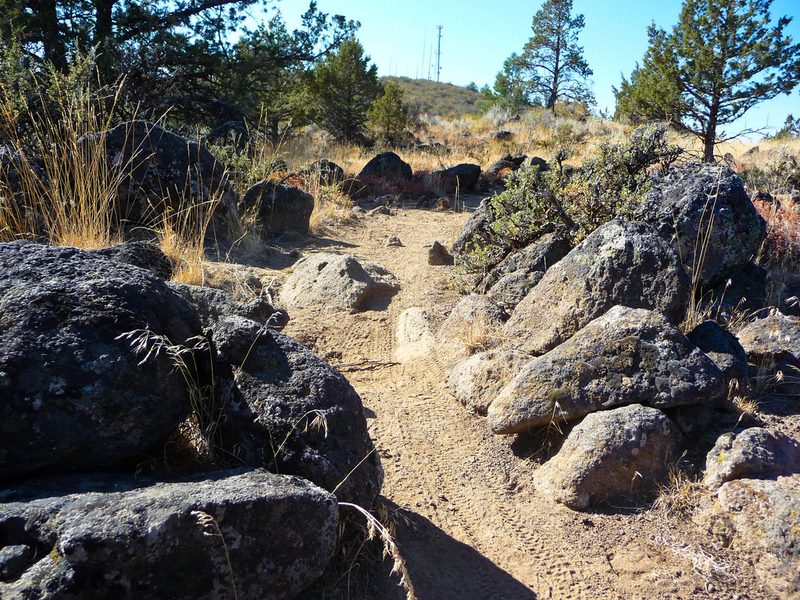 I hope to learn from readers of this blog about how to better plan for a trail debacle. 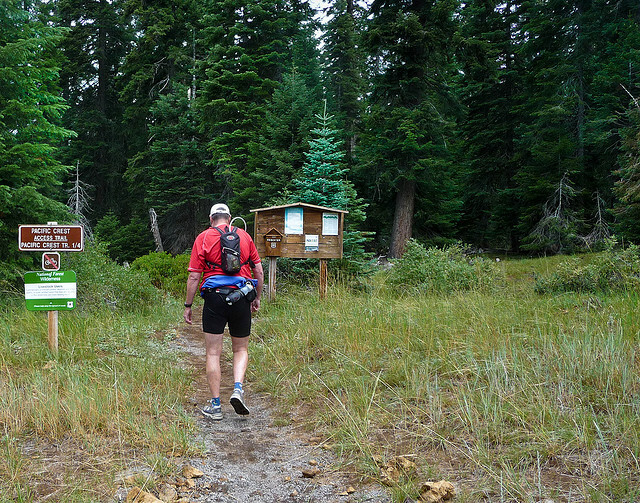 What kinds of things should a person like me, who is dealing with atrial fibrillation and is taking an anticoagulant (I take Pradaxa), carry on a long run in the wilderness? Or during a long mountain bike ride in remote areas? When the high country in our local wildernesses is not covered with snow, I will generally do runs, nearly every weekend, of anywhere between six to twenty miles. 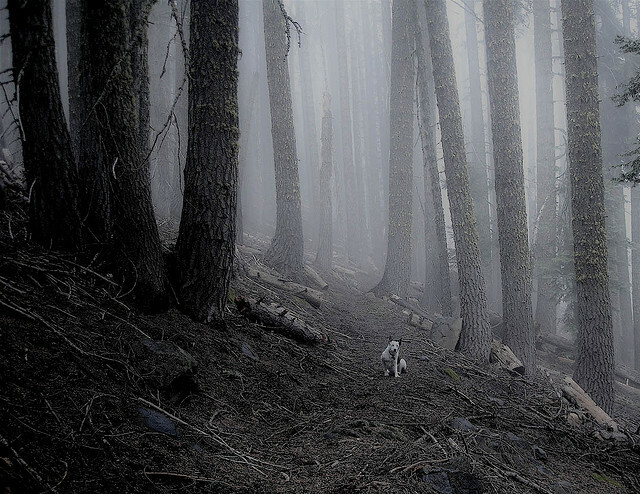 I almost always run alone (except for my trail buddy – Ringo). Dangerous and a bad idea? Possibly. But this is what I enjoy in life so I don’t plan on stopping any time soon. The most important piece of equipment is a phone. People complain that everybody is always on their smartphone, and they should NOT be talking on their phones on mountain summits when everybody else is trying to get all Zen-like and self-actualized, and whatever – that’s a different discussion. You certainly don’t even need to have your phone on; but you absolutely should take it with you, and it should be fully charged. The days of getting hopelessly lost and spelling out SOS with rocks hoping a search plane will find you are fading into the past. A smartphone is a GPS and a direct link to help. 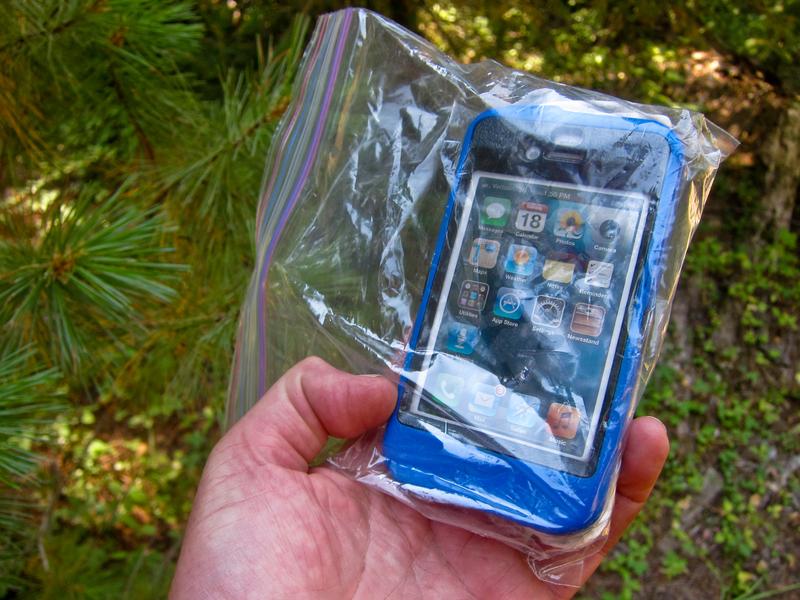 I always carry my iPhone in a baggie with my ID and a sheet of paper towel (which I use for unrelated toilet purposes). Even if there is poor cell phone coverage in your local high mountain or deep canyon wilderness, and a phone call isn’t always possible, I find that a text message can often still be sent. It might take a while but it eventually will be sent, especially if I am moving along a trail. 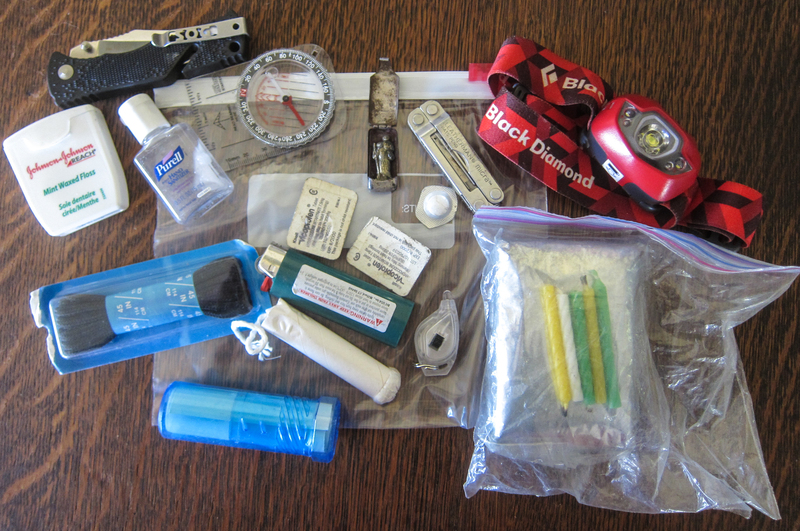 There is the standard emergency gear that most people take, often called the “ten essentials” which most people carry while in the wilderness. Of course there is truly no such thing as a standard ten essentials and the list of things you carry will vary depending on the season, your skill set, your location, and your past experience. 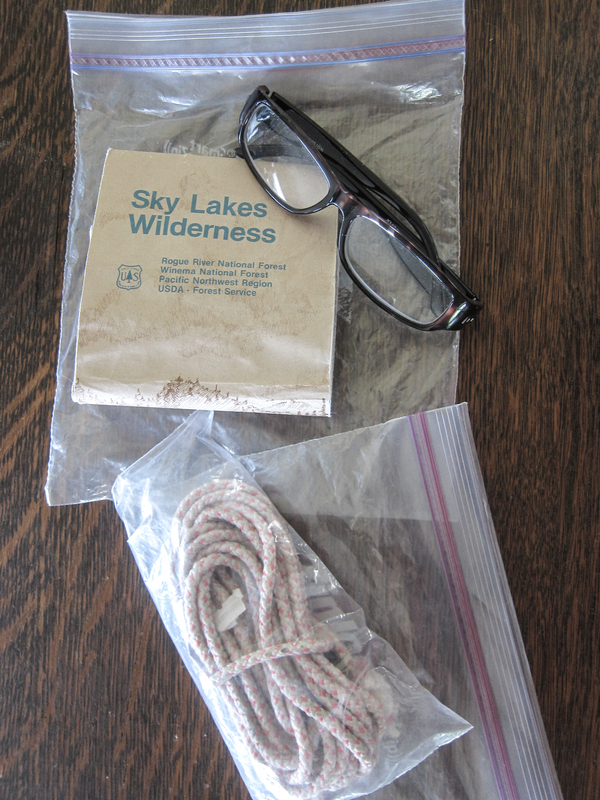 I got out my little survival kit that I typically carry in the wilderness, and of course not everything is pictured here, and I might not even have all of this stuff with me on any given trip. Naturally I will also have other things like food, gels, electrolytes, a jacket, and plenty of water. Two knives – a mini-leatherman tool and a standard knife. I will only actually carry one of these. Two lights – a headlamp and a tiny LED flashlight (one is plenty). Fire starter – a cigarette lighter, birthday candles, a tampon, and hand sanitizer (which I discovered has completely evaporated). A space blanket, a compass. Pain pills: Vicoprofen samples – okay they expired in 2000 but I’m guessing they are still good (at least for a placebo effect). Missing: Benadryl for allergies or yellow jacket stings, and I probably should have some of my Pradaxa in case I end up unexpectedly staying out overnight. Also missing: small roll of duct tape, safety pins, and my whistle! 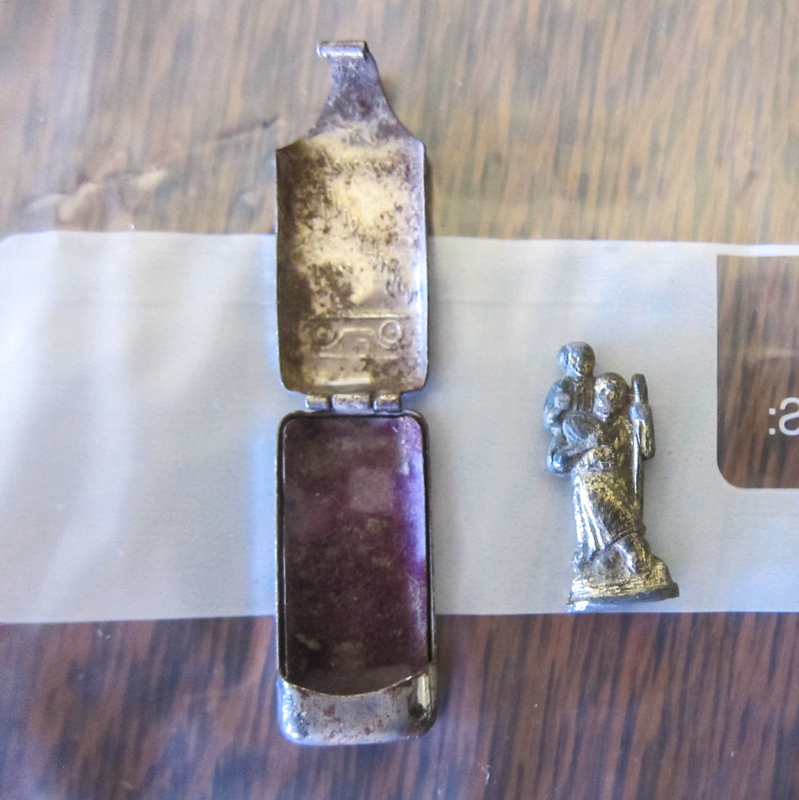 Oh, and there is a Saint Christopher medal. This one belonged to my grandfather. Well it probably won’t change anything, but it certainly couldn’t hurt. Feel free to substitute your own personal good luck charm. But what about specific items for the runner on an anticoagulant? Is there anything else beyond the “ten essentials”? Obviously having a major bleed while running alone in the wilderness would be a disaster. Death is certainly a possibility. 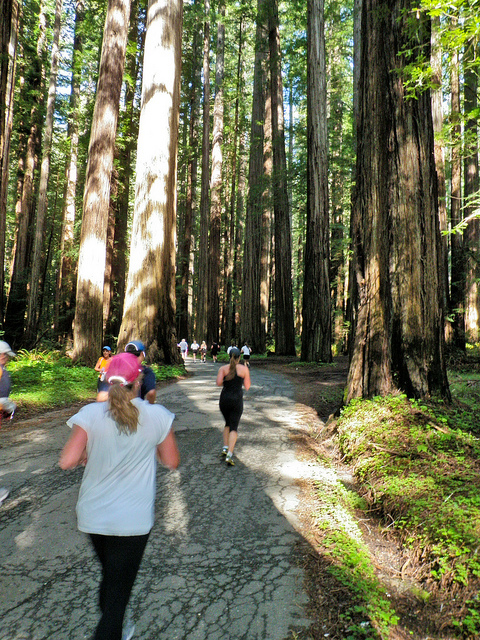 How can a trail runner prepare to increase the odds of a good outcome? I always make sure to let somebody know (usually my wife) where I’m going and I also send her a text (I text “OOTW” short for “out of the woods”) when I get back to my vehicle. I also wear a Road ID. This way if somebody finds me they will know I am on an anticoagulant. Maybe this won’t help, but it certainly is worth wearing. At least they will be able to figure out why I bled out so quickly (I know – not funny). 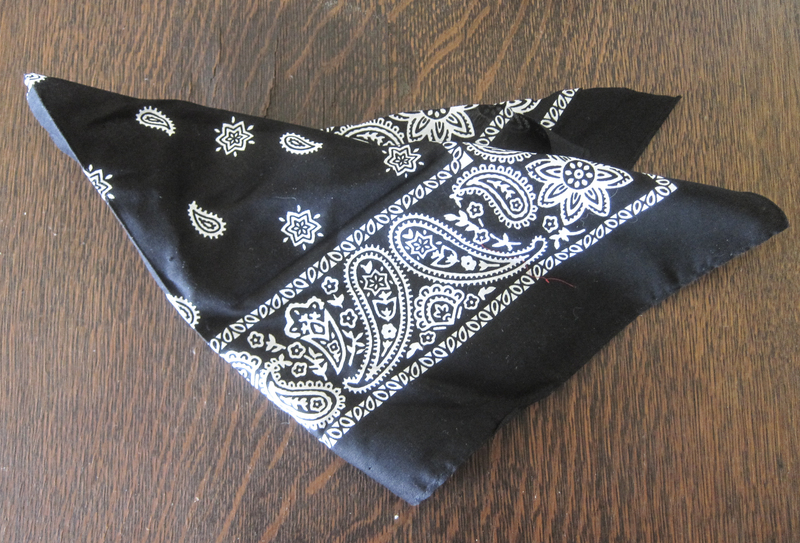 Another item I always carry is a bandanna. This can be used for a number of purposes, such as making a field dressing; but I want to have it in case I need a tourniquet. 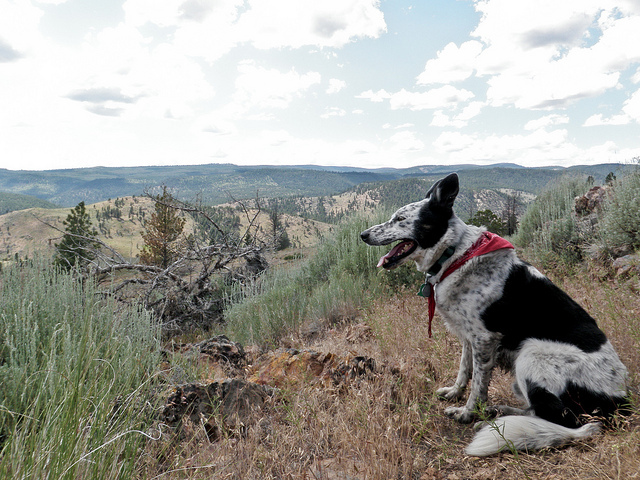 Plus – I have an extra one because my trail dog always has one draped around his neck. My bandanna came in handy a week ago when my wife Margo (not on an anticoagulant) crashed her mountain bike and punctured her left thigh with her brake lever. I used it to make a compressive dressing before we road our bikes back to where we could get a ride to the hospital. 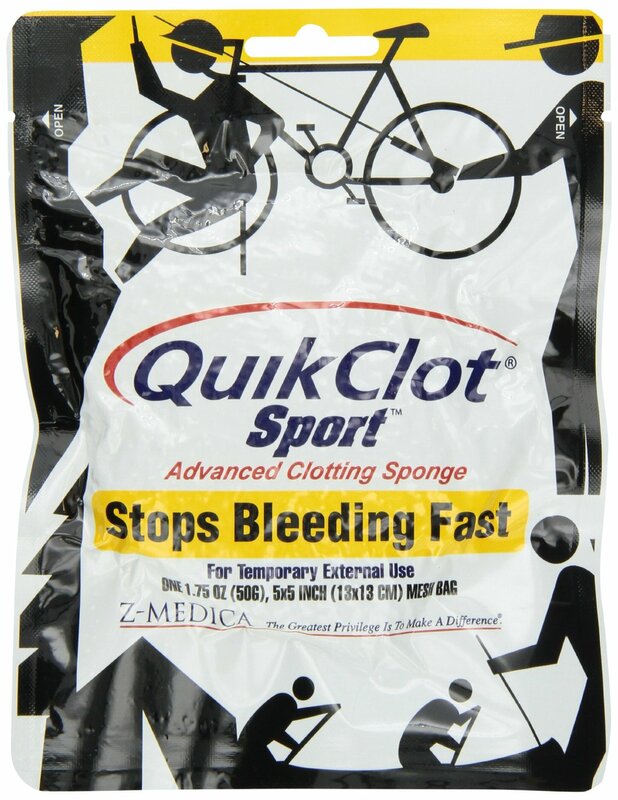 One item I do not currently have but definitely need to obtain is a Quickclot field dressing. Evidently these things really work and are routinely used in combat situations. It is a topical coagulant (an anti-anti-coagulant?) which helps clot blood and also serves as a physical barrier to bleeding. I’ve been meaning to obtain one of these for a long time. They are available online via amazon.com, and I just ordered one. Question: Will the Quickclot sponge even work on bleeding in an individual who is on a direct thrombin inhibitor like Pradaxa? Answer: I have no idea. I’ll let you know if I ever get a chance to find out. In case of bleeding the most important first step is to apply direct pressure. As a surgeon I have a lot of experience with this. Usually sixty seconds of direct thumb pressure will stop or slow most bleeding, but of course if you take an anticoagulant it will take longer. Apply direct pressure as long as necessary. Elevate the wound if possible. Don’t try to clean out major wounds as this will restart bleeding – that can be done later at the hospital. A tourniquet is a last resort, but the bandanna can be used as a compressive dressing if needed. Please understand that an anticoagulant doesn’t completely stop clotting of blood, it just makes it take longer. Eventually bleeding will stop. Hopefully before all the blood leaves your body! I have been plagued by frequent nosebleeds since I was a child but, oddly enough, I haven’t had a single nosebleed since I started Pradaxa a couple of years ago. The best method I have found is to pinch the nose, fairly tightly, just above the nostrils, and lean forward. Don’t lie with your head back – that doesn’t work. Hold for a full sixty seconds. Repeat as necessary. 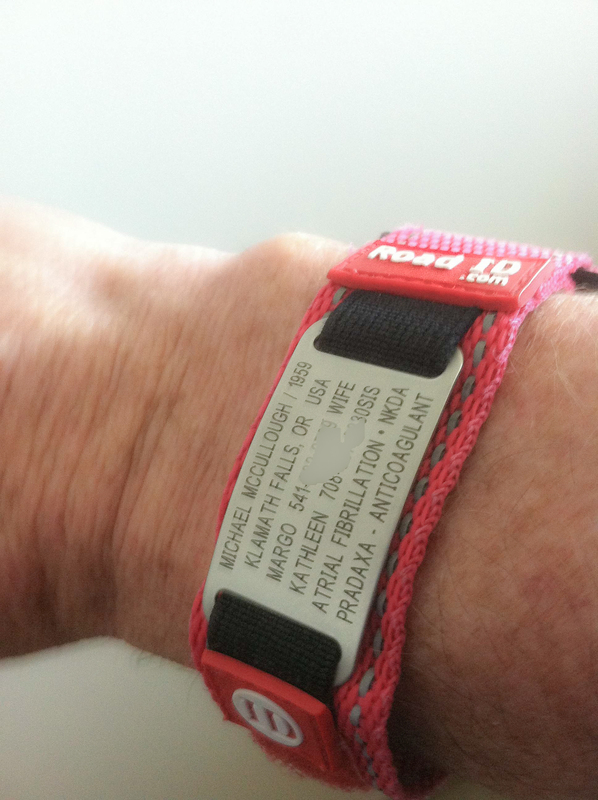 If you are, like me, a trail runner or mountain biker on an anticoagulant, I would love to hear from you. Please leave comments and suggestions in the comments area below. Here are a few internet news stories related to atrial fibrillation. In the future I’ll try to update more frequently so I don’t end up with four topics in one blog entry. Overall, the increase in risk of heart attack was about 70% in AF patients, even after accounting for other cardiovascular disease risk factors, such as hypertension, high cholesterol, body mass index, and history of stroke and vascular disease. However, when the researchers looked at subgroups, they found that increased risk of heart attack was more than doubled in women and African Americans with AF—but less than 50% for men and whites with AF. I’m not sure what to say about this – hopefully runners with atrial fibrillation (who hopefully also have other heart healthy lifestyle choices – like a healthy diet, not smoking, reasonable body weight) will do better than the general population. One bit of good news – the blood thinners a fib patients take to prevent stroke also seem to help prevent heart attacks. “Novel” anticoagulants refers to the newer prescription anticoagulants that are used as an alternative to Coumadin (warfarin). Specifically: Pradaxa (which is the one I currently take), Xarelto, and Eliquis. I can tell you that as a clinician there are not many things more frustrating than prescribing medications for people who are on Coumadin – it seems like it interacts with everything! One of the great things about the newer anticoagulants is that they have less drug interactions – but they still do have potential drug interactions. Please click on the link to see tables for drug interactions involving Pradaxa (Dabigatran), Xarelto (Rivaroxaban), and Eliquis (Apixaban). Obviously all of the novel anticoagulants can interact with any other drug that is *ALSO* an anticoagulant – like Plavix or aspirin. Keep in mind that this includes NSAIDs like Alleve (naproxen), Motrin (ibuprofen), etc. Personally, I completely avoid taking ibuprofen and naproxen – but every once in a while (like after a brutal long run) I will take a Celebrex. Tylenol (Acetaminophen) is fine – no interactions with the anticoagulants (although it has its own issues). By the way – if you read the article and see a possible drug interaction please don’t stop taking any of your meds – but contact your own doctor immediately for advice. A recent study has shown that Coumadin (warfarin) actually increases the risk of stroke for people in atrial fibrillation during the FIRST THIRTY DAYS of warfarin therapy. That’s just the first thirty days – the idea is to prevent having a stroke, and that’s what taking Coumadin does. This finding does not suggest that anything will change – doctors are still going to put people on warfarin to prevent stroke. They just have to get through the first thirty days! If you are on warfarin and you read this article – please do not stop taking your medication. 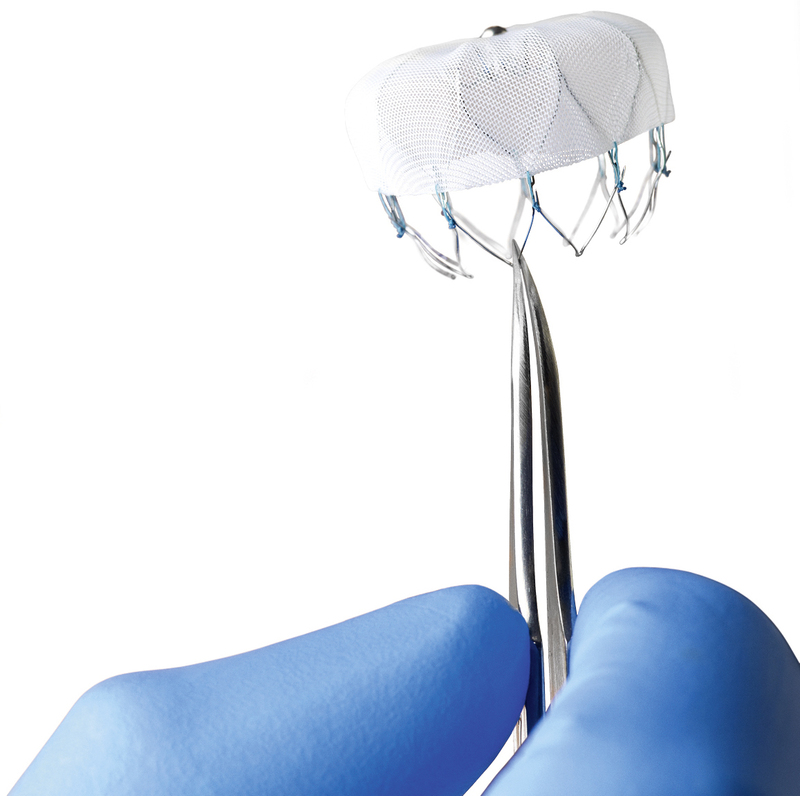 Finally – the FDA has not yet approved the Watchman left atrial appendage closure device by Boston Scientific – but it has given a “vote of confidence.” It appears that this gadget, which is implanted in the left atrium to prevent the formation of the clots that cause strokes, may be approved by the FDA for the US market late this year. The majority of the panel agreed that the Watchman was equivalent to standard treatment with warfarin, but it hasn’t been compared to the new novel anticoagulants (see above). The only specific treatment I take with respect to my atrial fibrillation is a blood thinner. 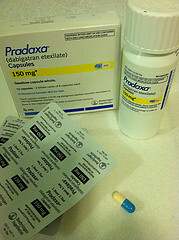 I am on Pradaxa which for me, I believe, is a better choice than no anticoagulation, aspirin, or Coumadin (warfarin). One of the worst things that can happen to a person in atrial fibrillation is that blood clots can form in the atria (plural of atrial), and can then release and become lodged in the brain. Since the left atrium is not really beating, and in my case it is quite enlarged, blood tends to pool here and this is perfect conditions for forming a blood clot. When a blood clot becomes lodged in the brain that is called a stroke or a cerebral vascular accident (CVA) and should be avoided at all costs. I actually met two different people, in one week, that had had strokes secondary to atrial fibrillation, and both of them were in their 50s. Both of them, regrettably, were lackadaisical about taking their anticoagulant at the time of their CVAs. Having a stroke, if you survive it, is an extreme life-changing event – definitely something to be avoided if possible. Some people do not take any blood thinner at all. If your CHADS2 score is zero this is an option. My CHADS2 score is technically zero, but because of my severe left atrial hypertrophy my doctors think it is best that I am anticoagulated, and I fully agree. Basically you get one point each for having congestive heart failure (C), being hypertensive (high blood pressure) (H), being seventy-five years of age or over (A), being diabetic (D), and you get two points if you have had a previous history of a stroke (S2). And it even spells CHADS2! So, for example, if you are a ninety-year-old diabetic with high blood pressure and congestive heart failure, and you have already had a stroke, your CHADS2 score is maxed out at six points. Yes, you should definitely be on a blood thinner. If you are a forty year old non-diabetic, non-hypertensive cyclocross racer who has demonstrated episodes of atrial fibrillation, but have no other risk factors, then aspirin, or no anti-coagulation at all, could possibly be an option. If you have atrial fibrillation is important that you discuss this with your doctor and listen to what he or she has to say. I’m not giving medical advice here, I’m just explaining the system. If your CHADS2 score is one aspirin or an anticoagulant such as coumadin may be an appropriate choice. But if your CHADS2 score is one or more you may want to be an anticoagulant such as Coumadin, Pradaxa, or Xarelto. Again, is important that you discuss this and agree with your doctor. There are four choices regarding anticoagulation, and the choices are 1.) no anticoagulation 2.) aspirin, 3.) Coumadin, and 4.) The newer, more expensive, but more convenient anticoagulants such as Pradaxa, Xarelto, and Eliquis. Coumadin is relatively inexpensive, but interacts with a lot of different medications as well as a lot of different foods. I am a vegetarian and I eat a lot of green leafy vegetables which would make Coumadin a difficult choice for me. Also when I previously took Coumadin for six months after my open heart surgery I was having migraine headaches nearly every day. I rarely have a migraine since I discontinued Coumadin nearly 20 years ago. I don’t take any other medications, but if you do take other medications there’s a good chance that Coumadin may interact with them as well. Coumadin also requires frequent blood tests in order to make sure your anticoagulated at the proper level. Pradaxa and Xarelto do not require any blood tests. The disadvantage, and this is a big disadvantage, is that Coumadin is reversible if you do develop a serious bleeding episode whereas Pradaxa and Xarelto, for all practical purposes are not. It is possible that Pradaxa and Xarelto may be reversible with dialysis; but how likely is that???? Pradaxa is taken twice daily, and Coumadin and Xarelto are once daily. 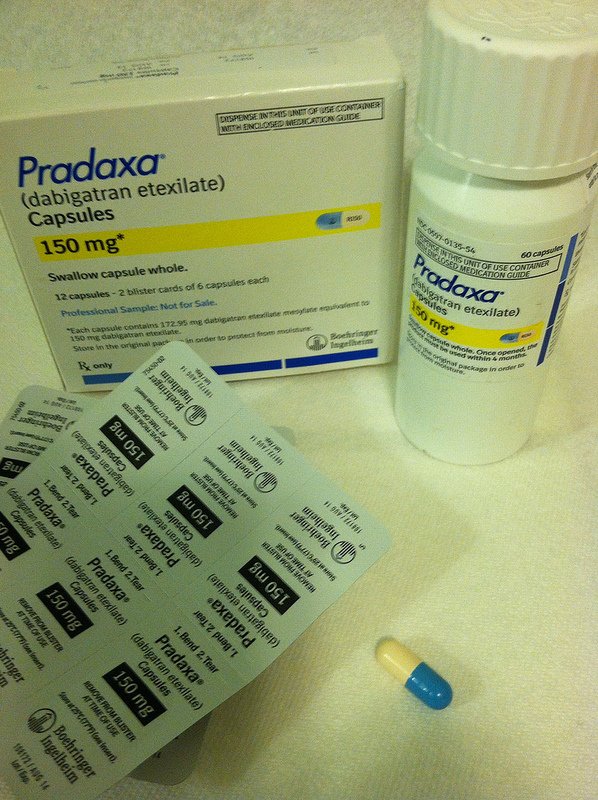 My doctor put me on Pradaxa after I was shown to have persistent atrial fibrillation. I have been taking it for over a year and really have had no problems. I’ve crashed my mountain bike just a couple of times and really haven’t noticed much difference as far as bleeding or bruising is concerned. But these were low-impact crashes and I realize there are some real dangers associated with anti-coagulation. It is important that you discuss this choice with your own health care provider. By the way – I am fully aware that there are a zillion commercials for suing the “bad drug” Pradaxa – but I am convinced, that for me, my diet, and lifestyle, Pradaxa is safer than Coumadin.